The County Avifaunas are a growing series of books, each of which gives details of the status and range of every species on the county list, with a detailed breakdown of rarity records. Each has introductory sections describing the county's ecology and habitats, climate, ornithological history and conservation record. 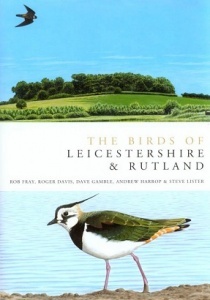 This new avifauna covers Leicestershire and neighbouring Rutland, an area with a particularly strong birding tradition - the Leicestershire & Rutland Ornithological Society is one of the largest county bird clubs in Britain. The region holds some of England's most important inland reservoirs, including the largest, Rutland Water. This massive lake holds some 10,000 wintering birds of a variety of species each year, and has an impressive rarity list as well as some of England's few breeding Ospreys. The county also has important woodlands, gull roosts and river habitats. Rutland Water is the home of the British Birdwatching Fair, the most important trade fair in the birding calendar. Hardback, 704 pages. 2009.